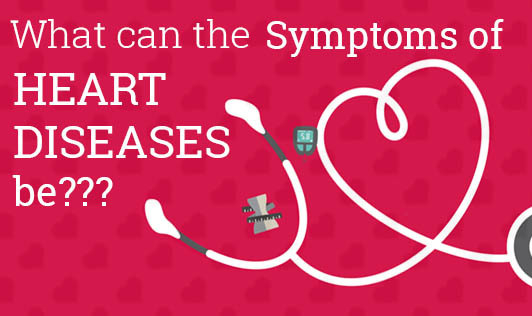 What can the Symptoms of Heart Diseases Be??? If it is about heart disease, then, is heart attack the first word that comes to your mind? Is chest pain the only symptom of a heart disease you can think of? Here, I take up for discussion a few heart diseases and the symptoms of the same. 1. Heart attack: When the coronary arteries that supply blood to the heart get blocked, the heart muscles get damaged causing an attack. Symptoms: Chest pain or pressure, discomfort spreading to the arm/back/throat/jaw, nausea, heartburn, shortness of breath, and rapid or irregular heartbeats are a few of them. Women may not feel pain in the chest but can show symptoms of nausea, heartburn, coughing, weakness etc. The longer you ignore these symptoms, the more damage it causes to the heart. 2. Coronary artery disease (CAD): It is the formation of sticky plaques inside the arteries reducing the amount of blood flowing through them. This is a precursor to the heart attack. Symptoms: Recurring chest pain (angina) can be the symptom! 3. Arrhythmia: Electrical impulses result in a heartbeat. Arrhythmia is a condition when these impulses become erratic; like slowing down or racing or quivering. Arrhythmia is usually harmless, but keep your Doctor informed if you observe the following symptoms. 4. Heart failure: It is not the sudden shutdown of the heart like a computer. It means, the heart is not able to pump enough blood to meet the requirements. The heart can enlarge to hold more blood or pump faster to increase the blood flow or the heart muscles weaken to reduce the blood supply. Symptoms: CAD or heart attacks can be the early signs. 5. Sudden cardiac death (SCD): Not to be mistaken with a heart attack! Here, the electrical system of the heart goes haywire instead of pumping the blood. Symptoms: Heart beating irregularly and dangerously fast. Men are at a higher risk of cardiac diseases compared to women. So, it is suggested that they go for regular health checks, eat a healthy diet, exercise regularly and maintain a healthy weight. Check for your symptoms today and know what not to do from your health Expert. Do your bit to prevent heart diseases!